Calling all “Strictly Come Dancing” Fans…..
“Strictly Come Dancing has been nominated for a National Television Award, seeing first hand just how much effort and hard work goes into making such a sparkling show, I would be so grateful if the Sulgrave Strictly fans ( of which I know there are many, especially Shrimp) would take time to vote on the link below. 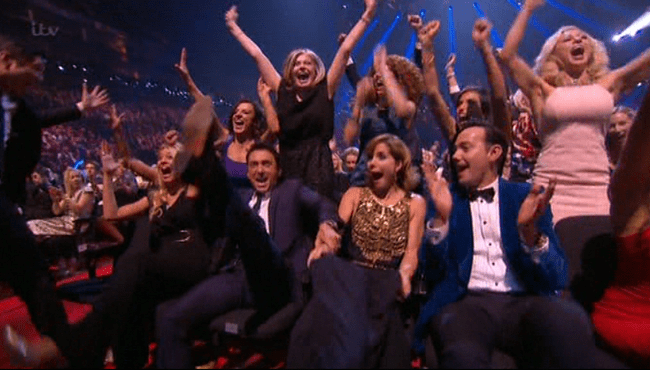 If Mark Benton’s MC Hammer routine made you laugh out loud and grin from ear to ear, Dave Myers being “Chuffed as Nuts” on the dance floor, Sophie and Brendon’s waltz gave you goosebumps or Abbey’s sheer delight at winning made you leap out of your chair, then please Sulgrave take the time to vote. This is your chance to show your appreciation! 24th January: Angharad emails that they won! See next page. Thank you so much for your wonderful post on the Village website; it made me feel very proud AND WE WON!!!! Attached is a pic of the trophy (complete with glitterball) and the moment we won, we are all over the moon.We are all so grateful, delighted and so, so, so happy that so many people enjoy what we do on a Saturday night and tune in and watch. Moments like this make the endless hours that people on a production work worth every penny. This entry was posted on Saturday, January 18th, 2014 at 8:44 am	and is filed under News. You can follow any responses to this entry through the RSS 2.0 feed. You can leave a response, or trackback from your own site.